I’m a financially-savvy value hunter and have always been on a look out for great products and services that give more bang for the buck. What you’ll see in this section are tips accumulated over the years that can help you save or make money. And they are not just limited to Travel or Beauty. Be auty Must-Haves: View a list of highly-recommended beauty products including my holy grail must-haves. Getting the right product on first attempt can help you save lots of money. Strawberrynet.com: You can often get great discounts on your beauty purchases at Strawberrynet. It is easy to navigate and provides free shipping to anywhere in the world. This company has been around since I was a teenager. :) Nice to see them grow to become a global company. Don’t forget to view the daily specials and best deals. Airbnb: I’ve been an Airbnb user for a couple of years and highly recommend it. It is almost always cheaper than hotel, many times giving the same value for just half the price or less. You can get S$45 discount off your first Airbnb stay (or S$17 off a travel experience). Booking.com: Booking.com is an established hotel-booking portal and has been been around for more than 20 years. You can get 10% savings off when you book your hotels through my link. Don’t forget to add and register your credit card details to receive your 10% rewards. Agoda: As a bargain hunter and avid traveler, I’ve explored different hotels-booking portals and have learnt over the years that the lowest price almost always come from Agoda. Therefore, Agoda is my default hotel-booking website. Just consider carefully when choosing the Agoda Pay Later option. Klook: You can get fantastic travel discounts when you book your tours, admission tickets, WIFI and transport through Klook. Most of the time, their prices are significantly lower than even the official rates. I’ve personally purchased products off the user-friendly portal and highly recommend it. Get up to S$50 off from now till 30 April 2019. EasyRentCars: A car can help you travel better. EasyRentCars compares and shows you the cheapest car available on your travel dates. You’ll also get to enjoy price-drop protection. Exclusively for my readers: You can get $20 off when you apply code MBC20 for min $200 spend; $30 off with MBC30 code (min $300) and $50 off with MBC50 code (min $500) ~ Offer valid till 31 May 2019. Click here to enjoy the deal! CabinZero: I have been using a CabinZero backpack for over 2 years and am super loving it. This Classic 44L saves me money when I travel on budget airlines because it is lightweight, durable and can hold lots of stuff. As such, I do not have to pay for check-in baggage. You’ll be amazed at how much the Classic 44L bag can pack! I have used it for trips stretching more than 2 weeks and was able to keep it under 7kg. Go get it. Highly recommended! Great Accommodations: View a list of highly-rated accommodations (5 stars | 4.5 stars | 4 stars) that I have personally stayed in and would recommend wholeheartedly. Amazon: I am not an avid online shopper, but would buy certain brands from Amazon, including Fitbit, Eaglecreek, Logitech and more. These purchases gave me 20 to 30% savings. I also depend on Amazon to get things that’s not sold in Singapore such as Vitamin C Serum. To make money from blogging, you will first need to have a blog. Start it right as some of the things would be very difficult to change later. I know it because I am spending days and nights trying to alter some elements of the blog now. Below are my recommendations based on first-hand experience. Bluehost (Hosting): If you are just starting out on a blog or website, choose a low-cost hosting company. At this stage, speed and up-time isn’t critical because you will be spending time on the basics, such as working out your intro pages, customizing your website design, setting up your social accounts, learning SEO and a whole lot of stuff. Bluehost is one of the cheapest hosting companies and comes free with a domain, SSL and a user-friendly dashboard. It’s easy to get your wordpress website up through Bluehost’s one-click installation. Plus, there’s a 30-day money-back guarantee. I started off using Bluehost for the first 2 years while growing my content and pageviews. Starting it cheap was great as I didn’t need to commit a lot monetarily in case this passion didn’t last, but it did of course. As of now, I’m still registering my website domain through Bluehost – since 2014. 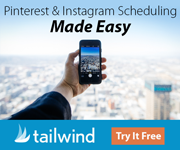 Tailwind (Scheduler): I pay monthly subscription for Tailwind Plus because this tool helps increase my pageviews and simplify my life. After trying out its free trial for a month, my Pinterest views increased from 3,000 to 80,000 (yes, within one month). My blog traffic and Ads revenue also surged. After the free trial, I stopped using Tailwind Plus and saw my blog statistics took a deep plunge. That explains why I’m now paying for the service. Give this Pinterest-scheduling tool a try! You can enjoy a free trial by signing up through my link. Blogging Tips (Vol. 1): I’ve been blogging for a while (since 2014) and am ready to share with you 10 Blogging tips that will help you increase pageviews, loading speed, subscribers and revenue. So, the blog is up. How do you earn money? Stay tuned as I will be sharing with you the things I’ve learnt in my blogging journey since 2014 and how this passion in sharing my thoughts with the world earns me passive income. I’ll keep updating this page whenever I come across great products. Great products are either one that help you save money, earn money or improve your life substantially. To ensure that you get the latest updates and honest reviews, click the button below to subscribe. If you don’t already know, I don’t spam and you are free to unsubscribe anytime with an easy click of a button. But if you like to be spammed, you can follow my instagram page where I’m more active. See you!